Launch into hyperdrive with some of the most iconic starships from Solo: A Star Wars Story with this Hot Wheels Starship Vehicle Wave 1 Case! Kids will love re-creating some of the galaxy's most epic battles and fiercest showdowns with each detailed die-cast metal starship. 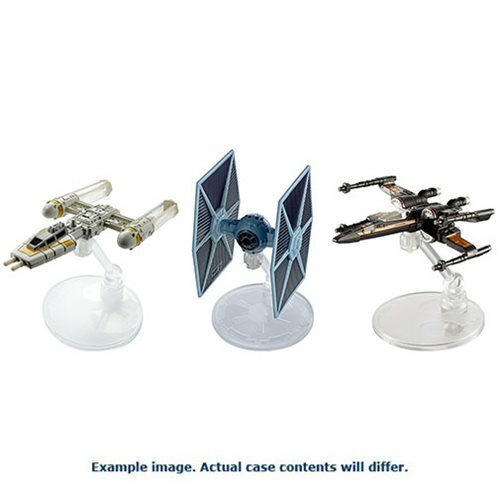 After the battle has been won, display each starship with the included flight stand! Each starship sold separately and not for use with some Hot Wheels playsets. This Star Wars Solo Hot Wheels Starship Vehicle Wave 1 (999A) Case includes 12 individually packaged vehicles.